A T-shirt honors UH Vollyball Coach Dave Shoji, after his 1,107th win on Sept. 6, made him the winningest coach in NCAA Division-I women’s volleyball history. HONOLULU (Sept. 8, 2013) — The University of Hawai‘i’s official retail store, Rainbowtique, unveiled a new T-shirt design this week to celebrate Rainbow Wahine Volleyball Head Coach Dave Shoji. His 1,107th win against Santa Clara on September 6, 2013, made Shoji the “winningest coach” in NCAA Division-I women’s volleyball history. 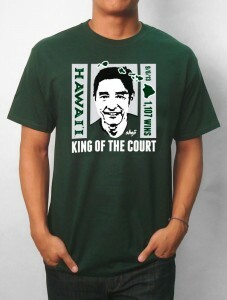 The commemorative green T-shirt prominently features an image of a smiling Coach Shoji along with his new title as “King of the Court.” In addition, the shirt states “9/6/13” and “1,107 Wins,” marking the record date and number of wins. The Hawaiian Islands chain and University of Hawai‘i Athletics’ trademark kapa “Hawai‘i” also appear on the shirt. The 100 percent cotton T-shirts, available in sizes S – 3XL, retail at $16 each and are available for purchase at all Rainbowtique locations – Ward Centers, Stan Sheriff Center, the Mānoa Bookstore, Waikiki Beach Marriot Resort and Spa, and online at www.uhrainbowtique.com <http://www.uhrainbowtique.com> . Other UH bookstores on select campuses across the state will also carry the shirts. Proceeds from the sales, as with all other items sold at Rainbowtique and the UH Bookstores, support the University of Hawaiʻi in its educational mission. Celebrate Coach Dave Shoji’s record-breaking wins in NCAA Division 1 history with this new commemorative T-shirt! We’re taking online pre-orders at www.uhrainbowtique.com. Available in stores soon.